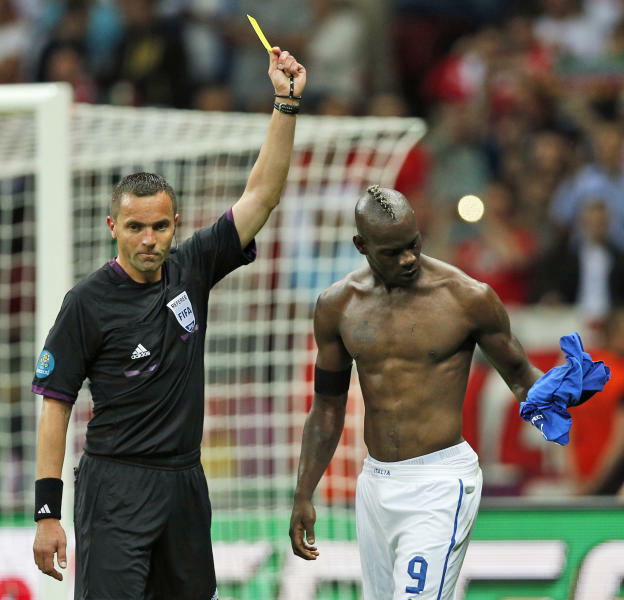 WARSAW, Poland (AP) — Mario Balotelli flexed his muscles in more ways than one. The 21-year-old striker quieted his of critics by leading Italy to an unexpected spot in the European Championship final, scoring twice in the first half in a 2-1 victory over Germany on Thursday night. After his second goal, Balotelli stripped off his jersey and flexed his muscles in a defiant pose — even if that meant an automatic yellow card. "This is the greatest night of my life, but I hope Sunday is going to be even better," Balotelli said, looking ahead to the final against defending champion Spain. "In the opening matches I had a lot of chances, and I wasn't able to finish them. But In football you also need luck." In the 20th minute, Balotelli had no trouble getting past Holger Badstuber to head in a pinpoint cross from Antonio Cassano. Then in the 36th, Balotelli received the ball behind the defense and blasted a long shot into the top right corner. With three goals, Balotelli is tied for the tournament lead. After the match, Italy coach Cesare Prandelli was asked if this was the best match of Balotelli's career. "Balotelli's career has just started," Prandelli said. Germany's winless streak against Italy in major tournaments reached eight matches. The Germans failed to trouble Italy for much of the match, although Mesut Oezil scored a consolation penalty in injury time after Federico Balzaretti was whistled for a handball. Germany entered the game on a world-record 15-match winning streak in competitive matches. "It's a very bitter defeat," Germany captain Philipp Lahm said. "We tried everything in the second half but our goal came too late. We have so much potential in our team but if we cannot give the right performance at the right time or are not clever enough, then we lose such a game." The final in Kiev, Ukraine, will be a rematch of Italy and Spain's 1-1 draw that opened Group C.
"We showed we're on Spain's level and that's where we started this run," Italy midfielder Claudio Marchisio said. "It's no longer a question of fear. Now we've got to pull out everything we still have inside ourselves." While Italy has won four World Cups, it's only European Championship title came in 1968. As they did in winning the 1982 and 2006 World Cups, the Azzurri have managed to maintain their focus despite a match-fixing and betting scandal at home. "All I can say is that when you talk about Italy, everyone needs to be careful," Prandelli said. "We played an extraordinary match. We displayed a model of fair play and attachment to this shirt." On a pleasant evening at the National Stadium Warsaw, Cassano set up the opening goal by befuddling Germany defenders Mats Hummels and Jerome Boateng to lift the ball in Balotelli's direction. "We did what we had thought would put them in trouble," Prandelli said. "We played centrally and looked for one-on-one opportunities with Cassano." In the 35th, Italy goalkeeper Gianluigi Buffon preserved the lead by swatting away a long shot from Sami Khedira — and Balotelli doubled the lead a minute later. "If we had scored earlier, there could have been more for us," Loew said. "The disappointment is great. Nobody is speaking in the dressing room. The players are crying. ... But I am not going to question everything we've done. This team has great quality. It will continue to develop and learn." White-clad German fans greatly outnumbered Italian supporters, unveiling a huge banner before kickoff that featured a giant "G'' for Germany. However, most of the stadium was filled with Polish fans cheering for Italy. "We're living a dream along with millions of Italians," Italy defender Giorgio Chiellini said. "We're going to enjoy this victory a little longer, then we'll think about Sunday, because we want to continue dreaming."